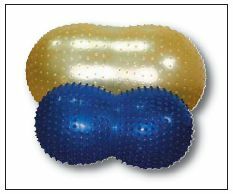 The Cando sensi-roll has a specially textured "nubby" surface that adds pleasurable tactile and visual elements to ball therapy. Saddle rolls are much easier to control than balls. The built-in saddle helps position the child and gives the child an added sense of security. Used to develop muscles, strength, coordination and balance.